Prime minister and chief of staff arrive for surprise inspection of reserve division's emergency supply depot. 'Readiness here is good." 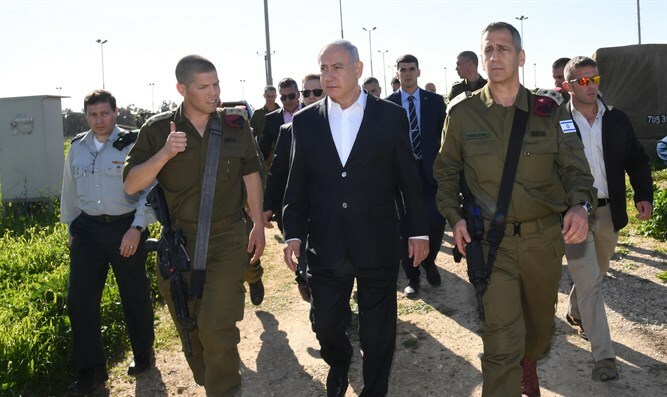 Prime Minister and Defense Minister Benjamin Netanyahu, this afternoon, Wednesday, at the IDF Syrkin Base, attended a surprise inspection of, and toured, an IDF reserve division's emergency supply depot. He inspected the quality of equipment along with IDF Chief-of-Staff Lt.-Gen. Aviv Kochavi, GOC Central Command Maj.-Gen. Nadav Padan and other senior officers. At the end of the tour, Prime Minister Netanyahu held a discussion at which he was presented with the findings and conclusion of the inspection, which the defense establishment comptroller had begun in the early morning. The Prime Minister will continue to hold inspections of the various IDF bases in the coming weeks as he studies the claims of the Brick report. "We are here on a surprise inspection at the Syrkin Base to evaluate the readiness for the transition from routine to an emergency. What I wanted to gain an impression of was, first of all, the logistical, physical and mechanical readiness, and I am very impressed. I will receive greater details but from what I have managed to see the command and equipment are ready, and stocks are full; this is the first thing that we are checking. Beyond this there is also an orderly plan of how to take soldiers who have just arrived here and bring them to the front as quickly as possible with minimal mishaps. While there certainly are things here that need improving, the Chief-of-Staff and I just now discussed one of them, regarding the famous trucks, but overall I think that the readiness here is very good." "My impression is that the readiness here for the day of command is good. I think that the forces that will come here with great strength and will express this strength on the battlefield. The IDF is also prepared for both defense and a crushing attack." The defense establishment comptroller, Brig.-Gen. (ret.) Eitan Dahan began his inspection of a reserve division's emergency supply depot at Syrkin Base at 06:00 this morning. The inspection was held pursuant to Prime Minister and Defense Minister Netanyahu's order to evaluate the readiness of the IDF. The surprise inspection was designed to evaluate both the readiness of the unit to carry out its wartime mission and its ability to transition quickly from routine to emergency. In keeping with the procedure for surprise inspections, the comptroller's personnel came to the base on short notice in order to carry out a comprehensive inspection of the depots.